When we started Sustainable Woodstock we formed action groups, not committees, so that our work would be focused on getting things done. Of our seven original action groups two are currently very active, another two meet occasionally and the final three have evolved. Today we have volunteers working on energy, the East End, community gardens, recycling, transportation, local food and community outreach. We also took a year off following TS Irene to run the Woodstock Area Flood Relief Fund. How do we celebrate community, economy and environment? 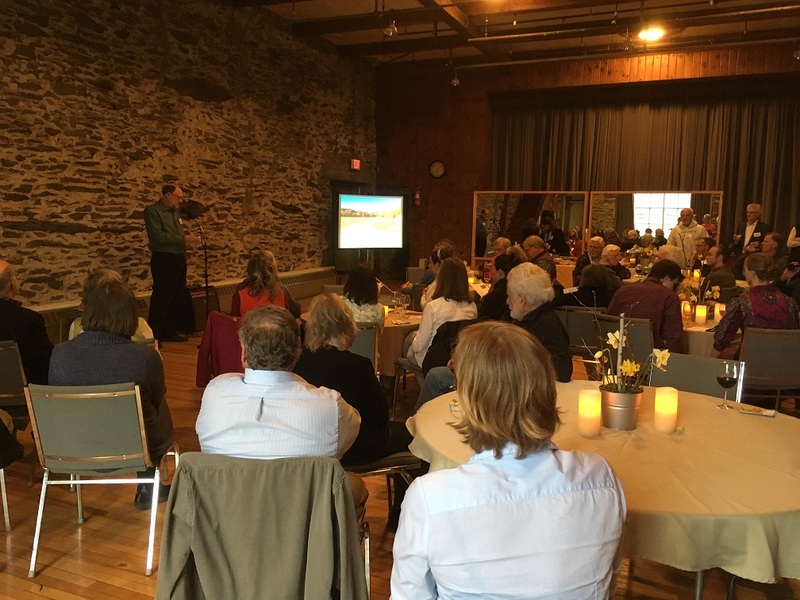 Our annual meeting on Wednesday, April 25 will offer us a chance to highlight our activities from the previous year and to celebrate what is happening locally. Our community awards showcase the good work that individuals and organizations are doing to improve the sustainability of our community. This year we will be celebrating our successful Weatherize Woodstock Pomfret Bridgewater program which saw over 70 households sign up for the program with 40 free home energy visits already scheduled. People who complete the program will see reduced energy bills and will help us reduce our community’s carbon footprint. Our Energy Group meets monthly on the second Monday and anyone is welcome to join us. We also look for ways to help residents be more sustainable by providing programs to help them protect our environment. On Saturday, April 28 we will hold our third annual shred and e-cycling day which will help to keep these materials out of the landfill. Volunteers also coordinate recycling and trash at public events like Road to the Pogue and Covered Bridges Half Marathon to reduce environmental impact of those events. The East End is an area where community, economy and environment clearly overlap. In the next few weeks, we will be highlighting our plans for the park, but look forward to some fun activities and projects to improve that community asset. In addition to community projects we also provide educational opportunities. Our ongoing carbon work-study program is an 8 month long series focused on managing forests for carbon storage and sequestration. The Saturday, April 21 meeting will focus on “The Negative Impacts of Parcelization on our Forests” with Kevin W. Geiger, Senior Planner with Two Rivers Ottauquechee Regional Commission and Monica Przyperhart from Vermont Fish & Wildlife Department. And don’t forget our monthly Green Drinks held the third Thursday each month. This month we will have a presentation and discussion led by Carol Stedman, a Hartland resident and local organizer with the Climate Reality Project. The Climate Reality Project is a non-profit organization founded by former Vice President Al Gore. Their mission is to catalyze a global solution to the climate crisis by making urgent action a necessity across every level of society. Check out the Sustainable Woodstock website for more details on all of our events. If you would like to receive our monthly e-newsletter to get regular updates on activities, just send a note to sally@sustainablewoodstock.org.